Burning causes releasing of water, among others, from the fuel in the form of steam. If the flue gas is hot enough, the steam leaves through the chimney together with flue gas. However, if the flue gas gets cooler at some spot, condensation of water vapor occurs there. The condensate contains products of burning that can be very aggressive esp. when burning wood or solid fuel and thus cause deposit formation on heat transfer surfaces and in steel boilers also fast corrosion. Blocked heat transfer surfaces increase the risk of lime formation and cause the efficiency of combustion getting worse. 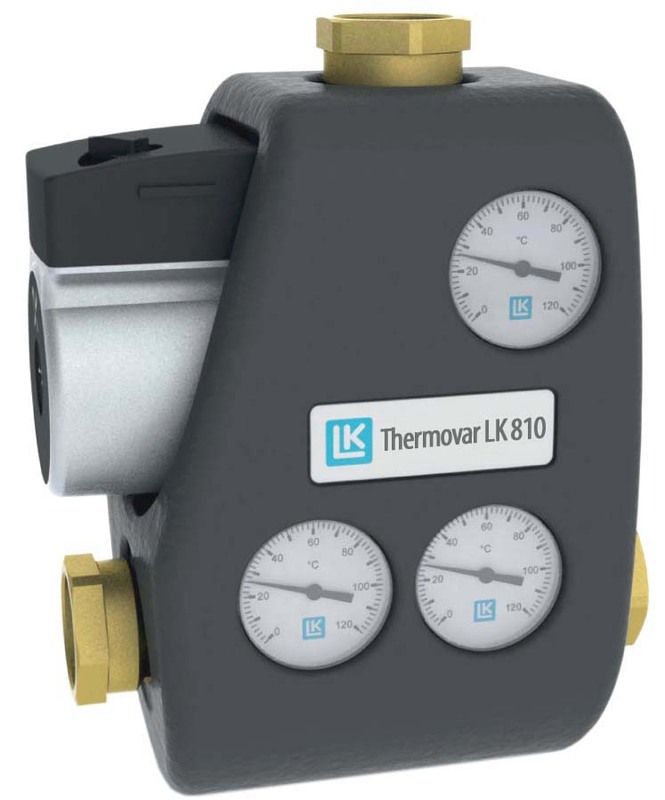 Termovar LK 810 thermostatic group mixes cold water returning from a heating system (or from an accumulation tank) with hot water from a boiler. This keeps return water at the given minimum temperature (55 °C, 65 °C, 70 °C according to model) and the boiler works with better efficiency. This process also limits clogging of heat transfer surfaces and formation of aggressive condensate. The lifetime of the boiler is then substantially longer. The higher the return line temperature, the lower the risk of condensate formation. The pump group also involves a floating check valve enabling boiler cooling by gravity circulation in the event of power supply failure, and at the same time recooling of the accumulation tank via an extinguished boiler is prevented.